BHEL Graduate/Technician Apprentices Recruitment Exam 2017: Bharat Heavy Electronics Limited BHEL, Bhopal invited application forms from the Engineering Graduates and Diploma holders for the engagement of Graduate Apprentices (BE/ B.Tech) and Technician Apprentices (Diploma). Total available vacancies are 229 posts in BHEL Bhopal Apprentices Recruitment 2017. Interested candidates may visit the BHEL official website www.bhelbpl.co.in and read the full advertisement to fill the application form. Opening date to submit online application forms is 20-11-2017. Last date to submit application forms is 10-12-2017. Applicant should have upper age limit of 25 years and lower age limit of 14 years as on 01-11-2017. Monthly Stipend for BHEL Graduate Apprentices is Rs.6000/- and for BHEL Diploma Technician Apprentices is Rs. 4000/-. Applicants will be selected for Graduate/ Diploma Apprentices is based on eligible applications received. 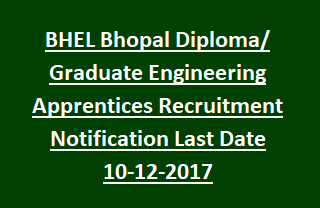 For more information regarding Application Procedure, Selection process, Important Dates, Age limit and Relaxations of Bharat Heavy Electronics Limited BHEL, Bhopal Graduate Apprentices and Diploma Technician Apprentices Recruitment vacancies are mentioned below. Total Apprentices vacancies available in this Bharat Heavy Electronics Limited BHEL, Bhopal recruitment are 229. Upper Age limit is 25 years and minimum age limit is 14 years. Age relaxations for SC/ ST is 05 years and for OBC candidates is 03 years. Graduate Apprentices: Bachelor’s Degree (BE/ BTech) in Engineering in relevant discipline with minimum 70% marks for General/ OBC candidates and 60% marks for SC/ST candidates. Technician Apprentices: Diploma in Engineering/ Office Management in relevant discipline. Based on the eligible applications received candidates will be short listed for Graduate/ Diploma Apprentices. Eligible candidates have to visit the BHEL official website www.bhelbpl.co.in and read the advertisement completely to fill the application form. Application form must be submitted through online from 20-11-2017 to 10-12-2017. After submission of BHEL online application candidate must have to send the self attested copies of following documents to the below given address before 17-12-2017. - ID and address proof etc.